The average cost of memory care in Palm Coast is $4,810 per month. This is higher than the national median of $4,650. Cheaper nearby regions include Saint Augustine with an average starting cost of $3,845. To help you with your search, browse the 1 review below for memory care facilities in Palm Coast. On average, consumers rate memory care in Palm Coast 2.0 out of 5 stars. Better rated regions include Saint Augustine with an average rating of 4.5 out of 5 stars. Caring.com has helped thousands of families find high-quality senior care. To speak with one of our Family Advisors about memory care options and costs in Palm Coast, call (855) 863-8283. Palm Coast offers sunny days, natural landscaping and ocean views to families and their loved ones in need of memory care for Alzheimer's disease or another form of dementia. According to the U.S. Census Bureau, 26.6 percent of the area's population is at or above the age of 65. To provide for the needs of seniors who require memory care services, Palm Coast offers three facilities to choose from. Memory care facilities are classified as assisted living facilities (ALFs) and are licensed through Florida's Bureau of Health Facility Regulation. To offer memory care services, the ALF must have 24-hour monitoring services in place, must provide an appropriate environment and activities, and staff must receive extra training in dementia-specific care. Seniors who are sensitive to the cold can enjoy Palm Coast's warmer climate. July highs average 90 degrees Fahrenheit while January lows hover at 46 degrees. The area sees no snow but the high humidity and average annual rainfall of 52 inches may be uncomfortable for those who prefer drier climates. The city is considered safer than just 37 percent of U.S. cities overall but, when compared to other areas of similar size and population, shows a crime rate that is lower than average, but families with loved ones receiving memory care should still take safety precautions. Violent crimes occur in the area at a rate of one in 436 and property crimes at a rate of one in 60. 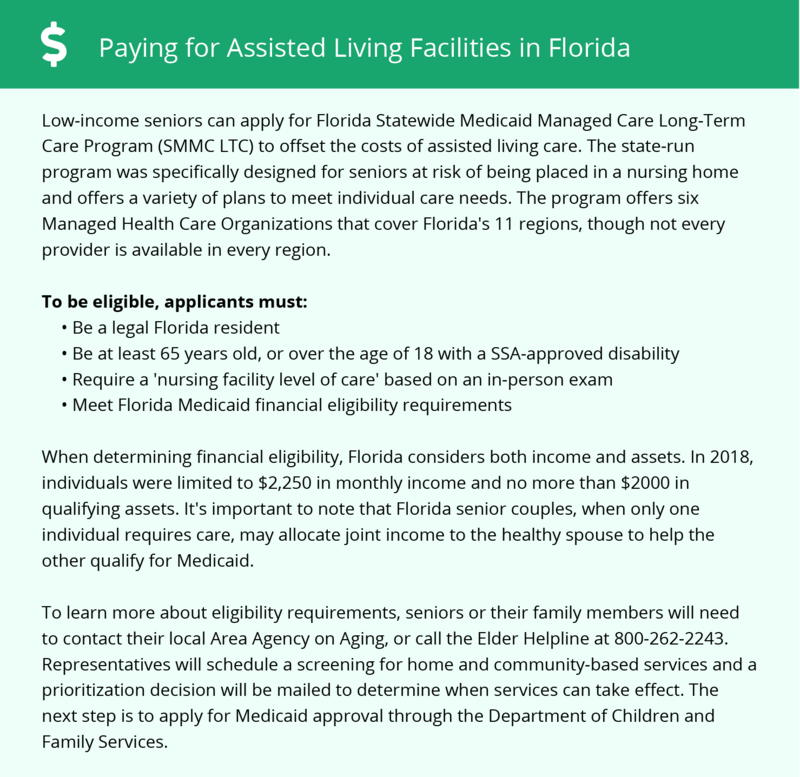 Families of seniors in need of memory care will appreciate significant tax savings in the state of Florida. With no state income tax, all retirement income sources, such as 401(k) payments and Social Security benefits, are untaxed. There are also no state or inheritance taxes charged and the property and sales tax rates are comparable to the national average. The Palm Coast area is home to world-class medical facilities, including those specializing in brain health and dementia care such as Florida Hospital Flagler, in the event of medical emergencies or illness. Memory Care costs in Palm Coast start around $4,810 per month on average, while the nationwide average cost of memory care is $4,800 per month. It’s important to note that memory care rates in Palm Coast and the surrounding suburbs can vary widely based on factors such as location, the level of care needed, apartment size and the types of amenities offered at each community. Palm Coast and the surrounding area are home to numerous government agencies and non-profit organizations offering help for seniors searching for or currently residing in an assisted living community. These organizations can also provide assistance in a number of other eldercare services such as geriatric care management, elder law advice, estate planning, finding home care and health and wellness programs. To see a list of free memory care resources in Palm Coast, please visit our Assisted Living in Florida page. Palm Coast-area assisted living communities must adhere to the comprehensive set of state laws and regulations that all assisted living communities in Florida are required to follow. Visit our Memory Care in Florida page for more information about these laws.